We can Replace Lost Saab Keys! Saabs are notorious for not being easy to work on and when it comes to making keys for them, most locksmiths just can't. 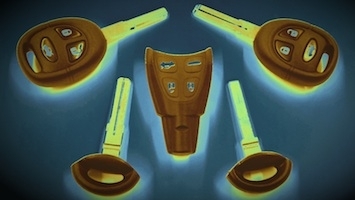 We have invested considerable time and money in the equipment and knowledge required to make keys for 9-3 and 9-5 Saabs even if the only key has been lost. Some locksmiths may be able to offer a service that requires shipping off the vehicle's computer to have it programmed to a new key, but we have the equipment necessary to do this in house. Therefore we can have a working key made for you on the same day that you call us in most cases. Due to the security system design on the Saab 9-3 and 9-5, it is considerably easier for us locksmiths (and cheaper for our customers) to make a key if one working key is available. If you only have one key for your Saab, we strongly encourage you to have a spare made. If you have lost your only Saab key, we can still replace it for you and have you back on the road on the same day.